Under braking and acceleration, the OEM bushing can flex enough for your wheel to move back and forth .500”! This deflection of the wheel causes drastic toe in and toe out changes under braking. The toe changes will cause steering wandering and an altered tire contact patch. When accelerating, this OEM bushing causes unwanted wheel hop and the car will want to follow the ruts in the road. After the PERRIN PSRS is installed, under braking the wheel will have zero deflection. Since there is no way for toe changes to occur, the steering feedback issues and wandering under braking disappears. Under acceleration the car will have far less tendency to follow the ruts in the road, wheel hop will be eliminated and in turn the car will have more front end traction. The bushing in the PSRS is purposely offset from center-line. This adds almost 0.6 degrees of caster to the front suspension. Caster is the angle on which the steering knuckle rotates. Adding caster makes the car turn in faster by providing a larger contact patch as the wheels turn on the steering axis. A byproduct of the PSRS kit is that it reduces some of the built in “anti-lift” that Subaru builds into the suspension geometry. Changing the geometry toward a Pro-Lift setup which means there is more weight transfer happening under acceleration and deceleration. During acceleration this helps transfer weight to the rear of the car creating additional traction for the front tires, which reduces understeer. Same thing happens under braking. 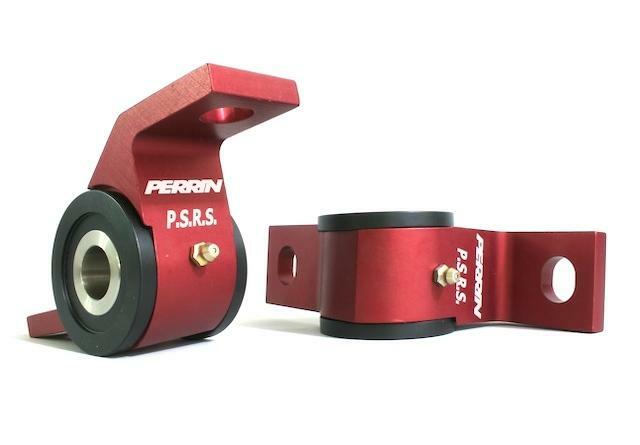 The PERRIN PSRS features custom made Delrin Bushings. Delrin is an engineered thermoplastic with a high stiffness, low friction and excellent dimensional stability. Delrin holds it’s shape, won’t wear out and can be machined to very low tolerances, For those wanting something in between the rock solid connection, and the super soft OEM Bushings, the Urethane Bushing upgrade is a great alternative. These are simple replacements for the Delrin Bushing we normally supply. They provide a slightly softer ride compared to the Delrin, and transmit slightly less noise through the chassis. The PSRS uses Zerk grease fittings to feed lubricant to the joint without the need to disassemble the PSRS. Grab your grease gun, and grease away!